Bedford Athletic made it 10 wins from 10 by thumping Oundle 65-17 in Midlands One East on Saturday. The match will be remembered for James Mortimer successfully surpassing the points record for the first team in the modern era, with his five conversions taking him to a career record 1,378 points, two ahead of Ashley Tapper’s 1,376. The first two tries arrived via crossfield kicks from Mortimer with Liam Walsh and Charlie Darlow benefitting for a 10-0 lead. Bedford’s control of the kick-off was a problem and following Darlow’s try the hosts conceded the ball and it took a well-executed interception by Josh Cassell to break it up as he raced away for a try from 80 metres. Mortimer converted. David Simpson darted away for a bonus point try on 25 minutes, Mortimer converting for a 24-0 lead. Oundle got one converted try back through Will Carrington in the 32nd minute, but Stephen Woodhead’s score made it 29-7 at the break. Ath dominated the first 20 minutes of the second period. James Wallace set the standard with a strong carry and wave after wave battered the visiting line before Ryan Taylor squeezed over, while Cassell’s second of the day opened up a 41-7 lead. Woodhead ran a fine inside line from a lineout in the 51st minute for his second, as Mortimer converted to equal the scoring record, before in the 57th minute Cassell completed his hat-trick to extend the lead to 53-7. A couple of errors in the home defence allowed Oundle’s Carrington to finish and they added another from a long kick by James Keane. 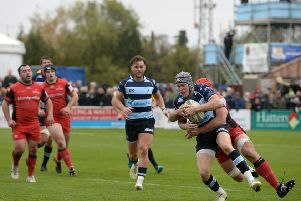 Bedford finished strongly with Cassell adding his fourth of the day and Harry Sawford-Smith charged through for another under the posts, Mortimer’s conversion made him the leading points scorer since the leagues began in 1987. There is a break from league action this Saturday and instead Bedford travel to Stockwood Park on Thursday night to start their defence of the Bedfordshire Cup.